I’m the only tomboy I know. I wear boys’ sports clothes, have boyish habits, and REALLY enjoy sports. And while I love my friends, none of them can really relate to that. Most of the girls are girly-girls, and the other ones are either not interested in athletics or are so loud and crazy I don’t want to be around them super often. I would hang out with boys, but the ones I know don’t really like hanging out with girls. When I’m with my friends, I feel really left out! I wish I could find friends that are more like me. Please help! I know you called yourself Tomboy Troubles, and usually I like to call people whatever they call themselves. But, I want to point out some problems I see with the word tomboy first. The term tomboy reinforces the idea that girls are supposed to look and act a certain way, and if they don’t, they must be some form of boy – a tomboy. It makes it sound like because you’re into sports, you’re not even female, and that’s ridiculous! What I like about your letter is that you seem comfortable with who you are. You’re not asking how to change how you look or act, which is awesome. You’re just trying to figure out how to fit in AS YOU ARE. And hey, aren’t we all? But seriously, major props on that. I get a LOT of letters from people who don’t fit in, wanting to know how to twist themselves into something different. Forget that! Embrace yourself – ESPECIALLY the things that set you apart from everyone else. But, being set completely apart from everyone else can get lonely. Yes, I’m a complete and total dork and I embrace that. BUT, I also have my completely dorky BFFs Chloe and Zoey at my side!! The thing is, I’m 100% SURE you’re not the only girl in your school who’s interested in sports – there are definitely other girls into sports like you! They just might also be into things you consider more “girly.” But if you find your common ground, you guys could relate to each other. 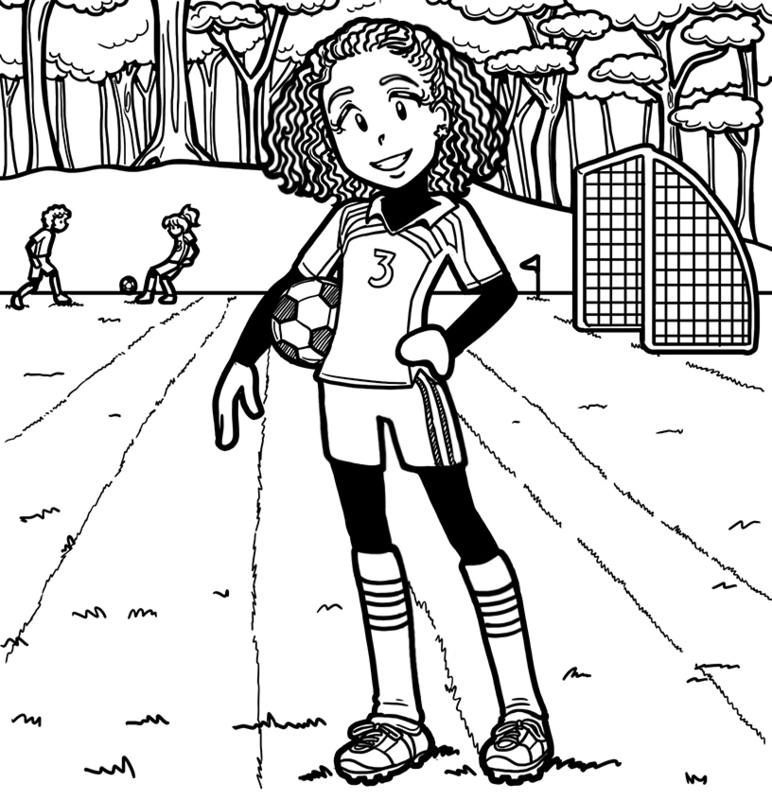 You might find out by signing up for a softball team or soccer club that one of those girls you thought was “girly” is also a stellar goalie or shortstop. You can’t always tell from looking at someone what they’re interested in. Maybe you could find those girls by starting a team or club at your school. Depending what sport you’re into, you could talk to a PE teacher about starting a girls’ team for it. Or, look into Girls on the Run, a really cool program that’s in all 50 states and might be able to come to your school. You can find existing locations here (https://www.girlsontherun.org/Find-a-Council). And, the website also has info on how to get a location started in your area (though you’d need adults to help and you’d need to do some fund-raising to get started). Outside of school, you could join an after-school team where you might meet other athletic girls. While this may not help you at lunchtime during the school year, it might help you to not feel so alone if you know that later in the week, you’ll be throwing the ball around with your sporty girls at practice. I hope that helps! I really hope you keep embracing who you are AND that you find some girls you can relate to!! If you guys can’t find kids to relate to at school, how do you handle it? What do you think about the word tomboy? Hey, girls can love bugs, nature, sports, blue, wrestling, and MUDDY MUD MUD! I love all of those things but blue. AND a boy can be into pink, sugar and spice, dresses, tutus, sugary stuff, and princesses! But personally, I think being in between ” Girly girl” and “Tomboy” is the best because you can be friends with just about anyone! Hey! I’m a tomboy too, and I feel the same exact way. I hang out with my older brother’s friends, who treat me like a boy and are always kind to me. My best friend is a tomboy too. You should just keep being yourself, and you will find that group of people who will help you fit in! Nikki I am a tomboy too, and I hardly have any friends that r girls. Most of the guys in my school crushs on me, and all the girly girls seemed SOOOOO jealous. Whenever we need to pick the buddies, I am the only girl who is left out, It seemed like everyone is talking behind my back and jealous. The only BFFs I have is___________ , ___________________ and ________________! Its sooo annoying. Nikki I am really annoyed cuz I am really into fashion, and I hang out with my 3 BFFs , but they r not into fashion like me. But there is a really popular group of ppl who I happened to like a lot becuz they r like me. One of the ppl in th group broke up with one of my BFFs, they litteraly hate each other!But my BFFs hate them becuz they think they r mean. What should I do?